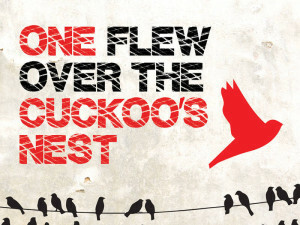 It was before my time when Ken Kesey’s 1962 novel One Flew Over the Cuckoo’s Nest was published, and I was a mere babe when the 1975 film came out starring the one and only Jack Nicholson; so it wasn’t until adulthood that I realized it was high time I checked into what all the fuss was about. 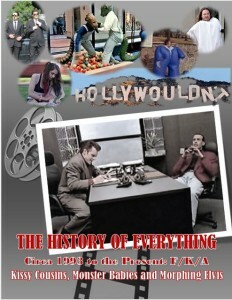 I recall watching the movie and being completely transfixed. The story was powerful; the performances beyond superb. And the ending. Boy, the ending – it still haunts me today. 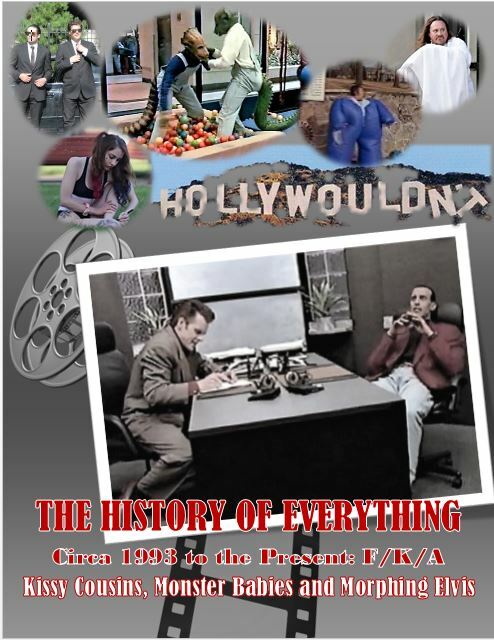 It’s no surprise that my life has been a dedicated exploration into the human condition, attaining a master’s in psychology, partaking in as much great theatre as I can, and having an unquenchable passion for writing stories of all kinds. 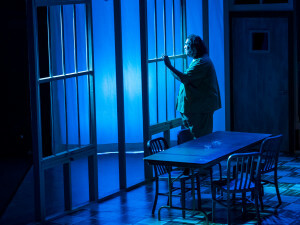 My husband/co-reviewer and I have since had the marvelous opportunity to experience playwright Dale Wasserman’s One Flew Over the Cuckoo’s Nest (it premiered on Broadway in 1963) on two different stages, most recently at West Hartford’s Playhouse on Park. In a nutshell, it’s a story about a battle of wills between a peculiar collection of male mental patients and their tyrannical caretaker, Nurse Ratched. All hell breaks loose when con man Randle Patrick McMurphy is transferred to the hospital from a prison farm thinking it might be a cushier way to count the days until freedom. 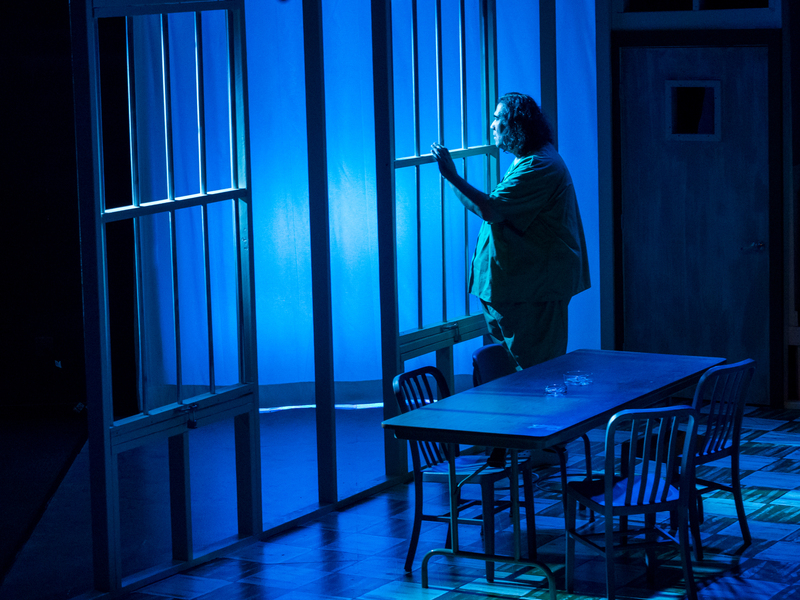 Of note, the major differences between the film and the play are that in the stage version, everything takes place on a single, stationary set; and unlike the film where the action centers on McMurphy, (but as in the novel) the story is told from the point of view of a very tall half-Native American mental patient named Chief Bromden who feigns deafness so that he can retreat from social interaction. With McMurphy as their power source and savior, the mental patients begin to rebel against Ratched’s dehumanization of them as well as the wicked ways in which she overmedicates, manipulates, and shames them. One by one the oppressed transform in McMurphy’s presence and wreak havoc across the ward. Throughout, Chief Bromden quietly takes it all in, sidestepping from time to time into colorful narration. With a talented cast under the direction of Ezra Barnes, Playhouse on Park brings this iconic story to life. To be fair, there’s no one quite like Jack Nicholson; however, Wayne Willinger does a fine job as the surly, sharp-tongued wannabe psychopath with a heart (now there’s an oxymoron). Chief Bromden, played by Santos, is the big man with the small voice who struggles to regain the power that’s been taken from him. Patricia Randell is perhaps too good at playing the bully in white, Ratched. She’s so convincing, you’ll hate her with a passion. Alex Rafala delivers as Billy Bibbit, the nervous stutterer who blooms in McMurphy’s light. Adam Kee is a wonderful Dale Harding, the voice of reason and least “ill” of the patients. 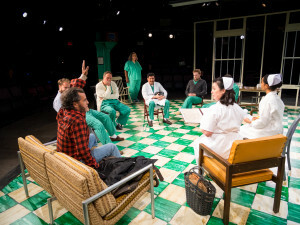 Rick Malone as Cheswick, John Ramaine as Frank Scanlon, Harrison Greene as Anthony Martini, and Ben McLaughlin as Ruckley (also as Technician) round out the patients of the ward and are terrific. Katya Collazo is equally as wonderful as the meeker Nurse Flinn and also, prostitute Sandra. Athena Reddy knocks it out of the park (no pun intended) as the other prostitute and McMurphy’s partner in crime, Candy Starr. Andrew R. Cooksey Jr. as the oblivious overnight watchman, Aide Turkel, as well as Justin Henry and Lance Williams as daytime staff, Aides Williams and Warren, respectively, embody the uncaring, apathetic attendants of mental hospitals of the past. Last but not least, David Sirois is great as Dr. Spivey, the easily swayed doctor of the ward, who kowtows to Ratched instead of taking matters into his own hands. 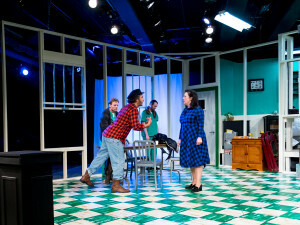 Scenic Designer David Lewis created a superb hospital day room, accented well by Eileen O’Connor’s properties & set dressing. Shout outs to Lighting Designer Aaron Hochheiser, Original Music & Sound Designer Lucas Clopton, Costume Designer Michele Sansone, and Stage Manager Mollie Cook. 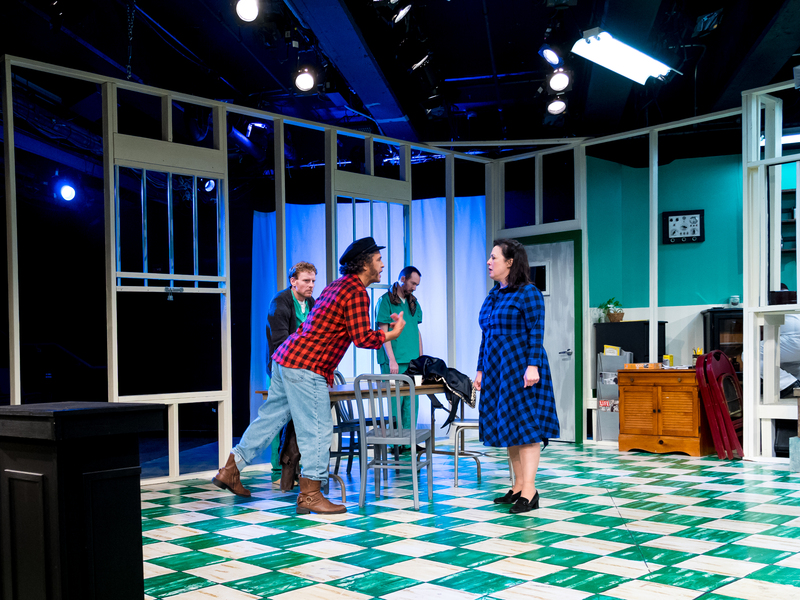 Whether or not you’ve read the book or seen the film or stage version of One Flew Over the Cuckoo’s Nest, you’ll enjoy the exceptional work by Playhouse on Park. Kesey’s brilliance is unparalleled and the enormity of his story cannot help but touch you deeply. I need to disclose right up front that I am a Ken Kesey devotee and One Flew Over the Cuckoo’s Nest groupie. I’d discovered the novel long before it was made into a movie by Milos Forman in 1975 and immediately read Kesey’s other novel, Sometimes a Great Notion. Although I did not agree with the whole acid tripping he and his Merry Pranksters did, I thought his writing was right up there with Hemmingway and Faulkner. So once when in a brick-and-mortar bookstore a few years ago (remember those?) my son picked up Tom Wolfe’s The Electric Kool-Aid Acid Test and asked if I had ever heard of Ken Kesey or the Merry Pranksters, he was shocked that not only did I hear about it but knew nearly every factoid there was about One Flew Over the Cuckoo’s Nest. Today, at least in my opinion, any attempt to do a revival of the play is tantamount to that scene in The Deer Hunter when they are playing Russian roulette. The chances of shooting yourself in the foot or even worse are extremely possible. After all, Kesey’s novel to this day remains a crucial and commercial success which is required in those liberal school systems that haven’t banned it. The 1975 Academy Award-winning film with Jack Nicholson still stands up as an electrifying, riveting piece of cinematic storytelling. So, kudos to Playhouse on Park for even attempting to do One Flew Over the Cuckoo’s Nest. And we’ll have to give it even more kudos and props for successfully pulling it off. The casting was spot-on. Let’s face it, the actors had some tough shoes to fill when you think that Randle Patrick McMurphy was originally played on Broadway by Kirk Douglas and later in the film by Nicholson. Additionally, you had an incredible ensemble in the film version that included Louise Fletcher, Will Sampson, Danny DeVito, Christopher Lloyd, Brad Dourif, and Scatman Crothers. The cast filled those famous shoes comfortably. Wayne Willinger played McMurphy with zest and just the right mix of satirical defiance when it came to authority. Patricia Randell’s subtle but no less menacing portrayal of the evil Nurse Ratched was chilling. Alex Rafala did an excellent job with the stuttering Billy Bibbit, a part for which Dourif won the British Academy Award. Honorable mentions must go to the rest of the talented cast whose eccentricities and quirks lent verisimilitude to the asylum without being so over the top that it was distracting to the main action: Harrison Greene (Anthony Martini): Katya Collazo (Nurse Finn/Sandra): Adam Kee (Dale Harding); Andrew R. Cooksey Jr. (Aide Turkel); Rick Malone (Charles Cheswick); Justin Henry (Aide Williams); John Ramaine (Scanlon); Athena Reddy (Candy Starr); David Sirois (Dr. Spivey); and Lance A. Williams (Aide Warren). A special shout-out must go to Santos who gave a poignant portrayal of Chief Bromden – the character who Ken Kesey actually wanted to narrate the film version. It says in Santos’ bio that he does stand-up comedy in New York City clubs. After watching his intense portrayal, I would love to see the lighter side of his range of emotions. Esra Barnes (who Pillow Talking loved in I Hate Hamlet) did an excellent job directing this very difficult piece. One flew East, one flew West, but you should fly over to Playhouse on Park to see One Flew Over the Cuckoo’s Nest before it flies off.